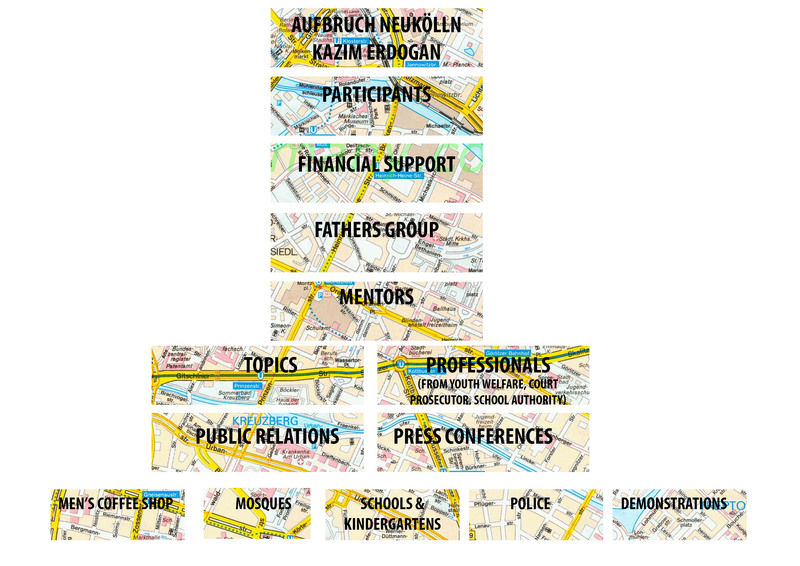 The widespread understanding of informality as a) informal economy in opposition to formality, explaining economic activities as survival practices in the absence of alternative opportunities or b) in connection to housing, characterised as unauthorised or unplanned urban settlements, conveys certain limitations making it hard to analyse informality in Berlin. The negative implication is mainly triggered by the notion of informality as opposition to the prevailing legal and institutional frameworks. 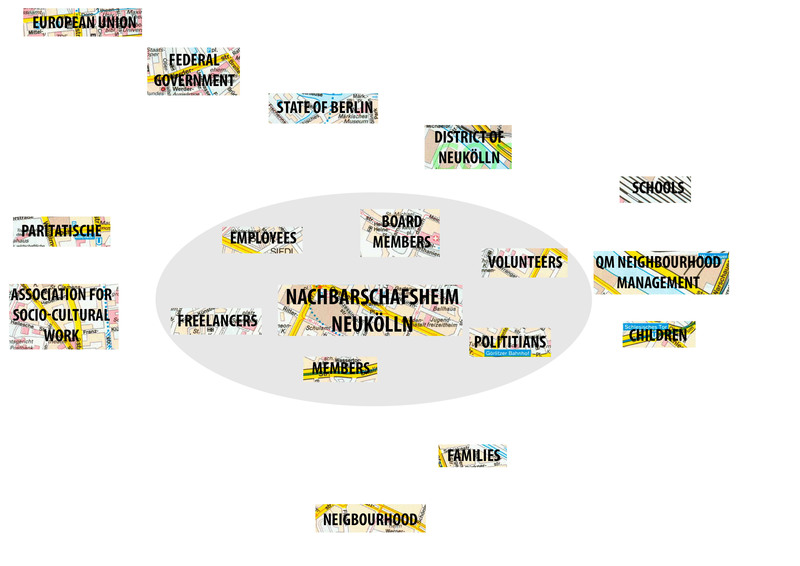 For the research we decided to analyse different scales of organisations in the Berlin neighbourhood Neukölln: Aufbruch Neukölln (www.aufbruch-neukoelln.de), IBBC e.V. 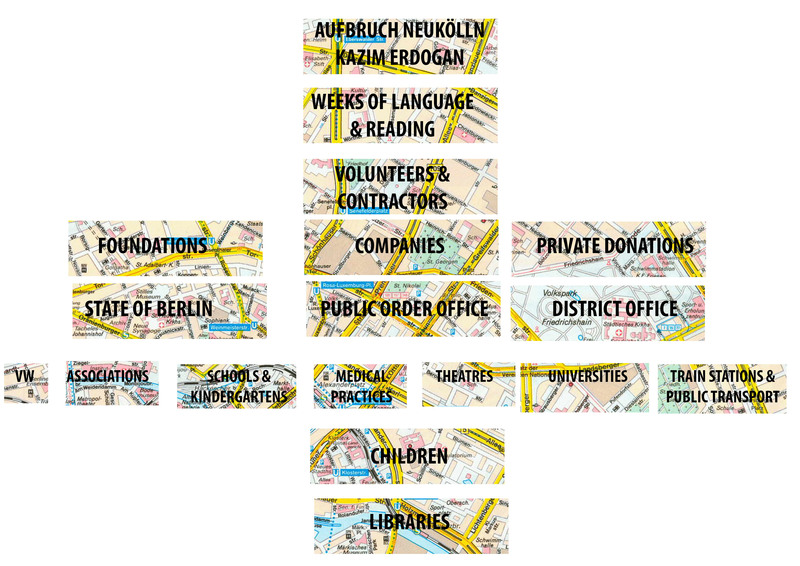 (www.ibbc-berlin.de), Nachbarschaftsheim Neukölln e.V. 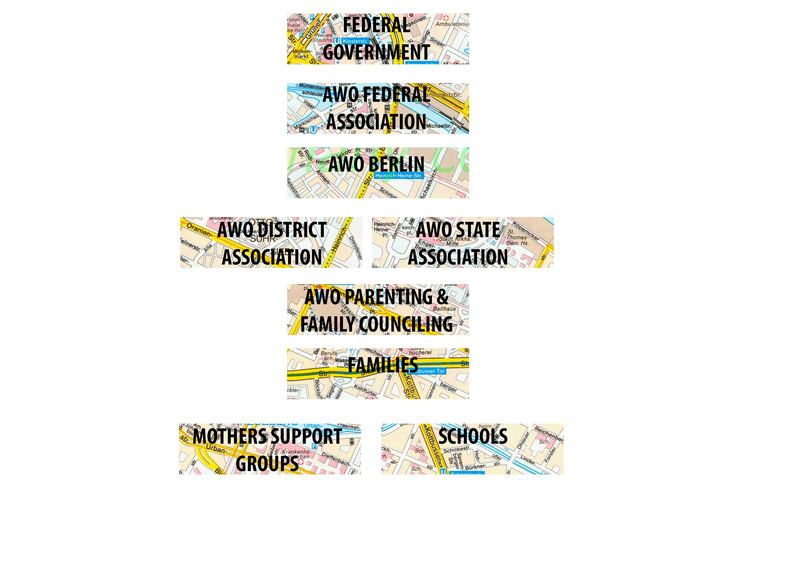 (www.nbh-neukoelln.de) and AWO (www.awoberlin.de/public/content4_a/de/00000012020000000231.php). The study of different scales of participation and community support within these organisations is crucial in understanding the structures and the potential they have for empowerment at grass roots level. By talking to these different organisations about their methods of professionalism, decision making regarding project development, connection with the community, organisation structure, and ways of funding it was hoped to uncover formal and informal processes of the organisations. 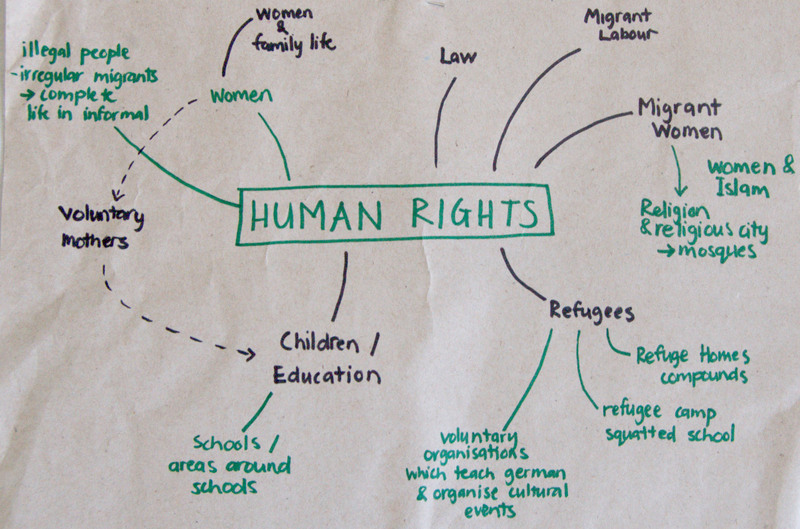 The initial step of the research was a mind-map, collecting interests and ideas of both tandem partners, circling around human rights. partners, circling around human rights. After this visual start off, we listed potential interview questions and assumptions, but We found this difficult for several reasons: 1) some interviews could only be conducted in German and had to be translated in the process; 2) we found language to be limiting, as there was nothing to engage with, conducting an interview in this manner simply had questions and answers, and we struggled to formulate how we would represent our findings; and 3) we realised that through questions we would lead the interview in a certain direction. 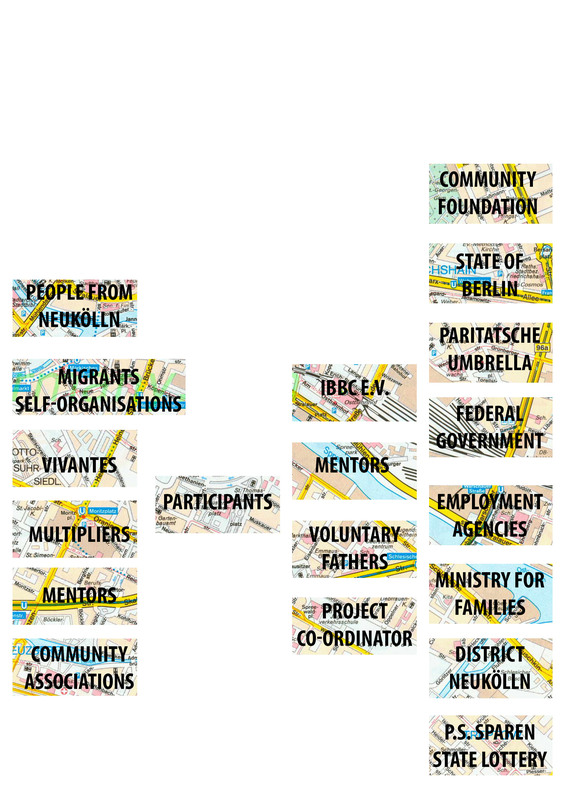 Since we were studying the structures of these community based organisations, we thought it would be helpful to engage with some kind of structural model. 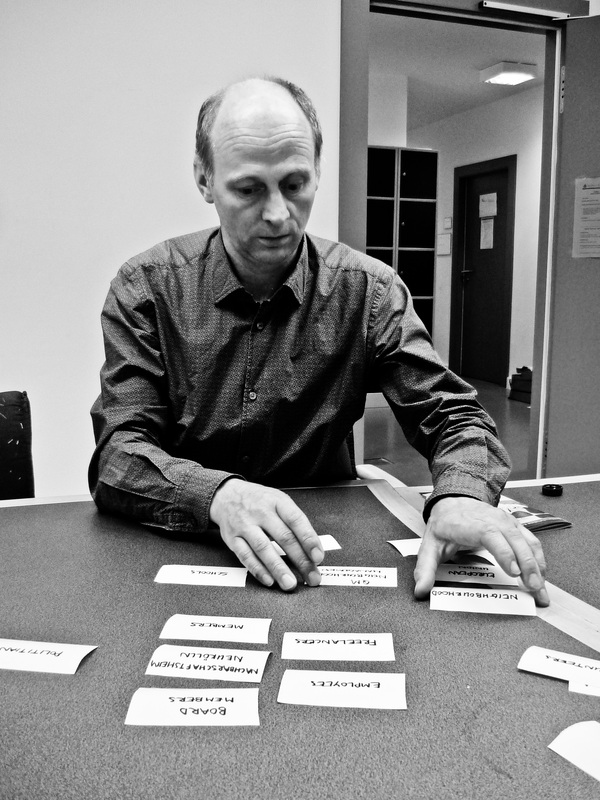 We developed the idea to divide the interviews into two parts. 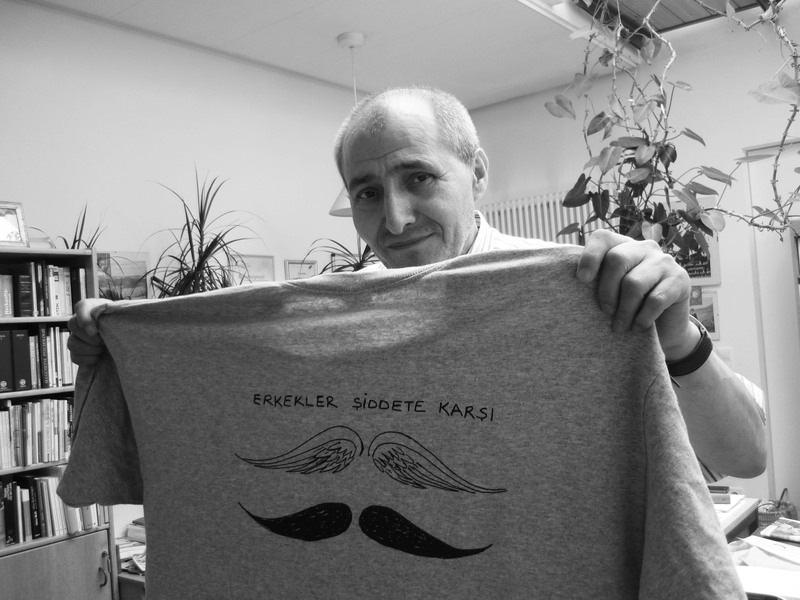 In the first phase the people explained their organisations and projects to us, and we asked questions. In the second phase we wrote down key players that came up during the interview. Together we collected missing partners, people or organisations involved and then the interviewed person was asked to structure the pieces of paper. This process formed a critical role in the interview process, as it actively engaged the person being interviewed, and we were able to see this process through which they thought. An important outcome of this methodology was for both sides to understand clearly how the structure of the organisation worked and it was interesting to see where the person saw themselves as an organisation within the network. 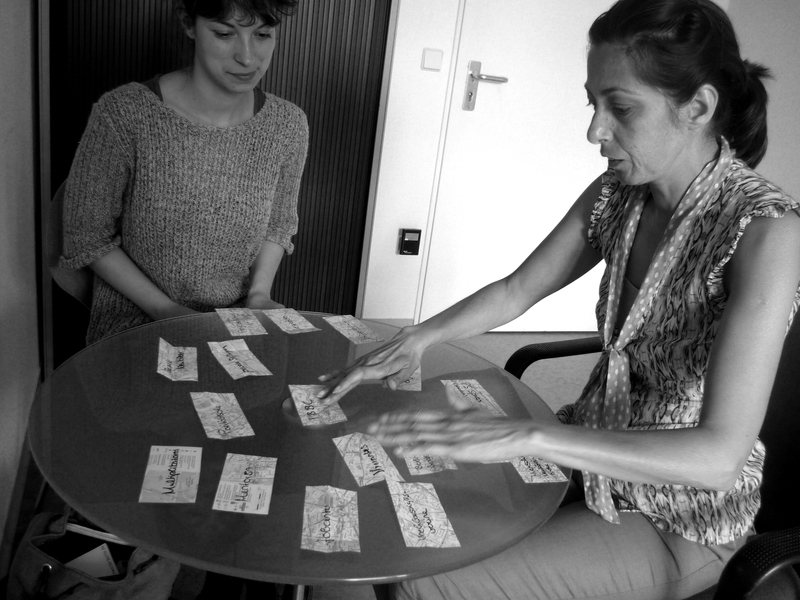 Through this we were able to combine more traditional interviews with a visual and haptic method. 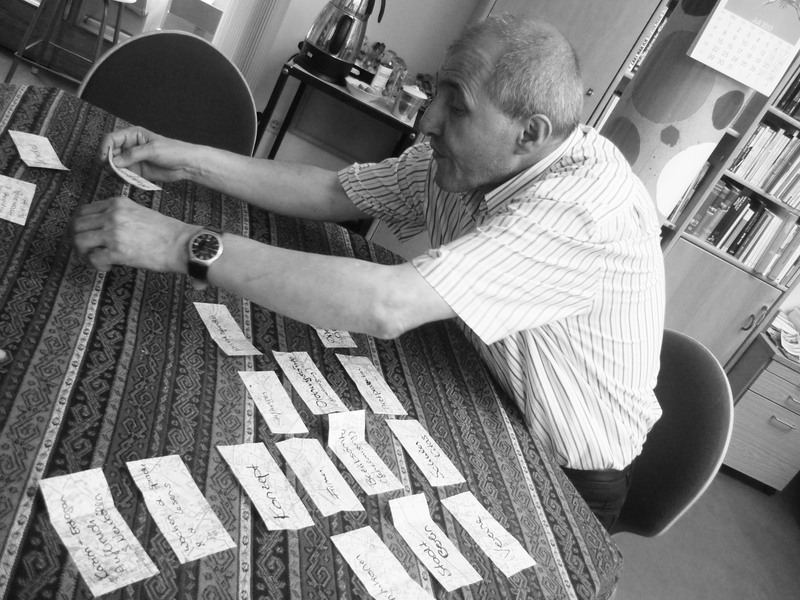 The moving back and forward between language and visual approaches in the process of working was achieved thanks to the different backgrounds of the tandem partners. 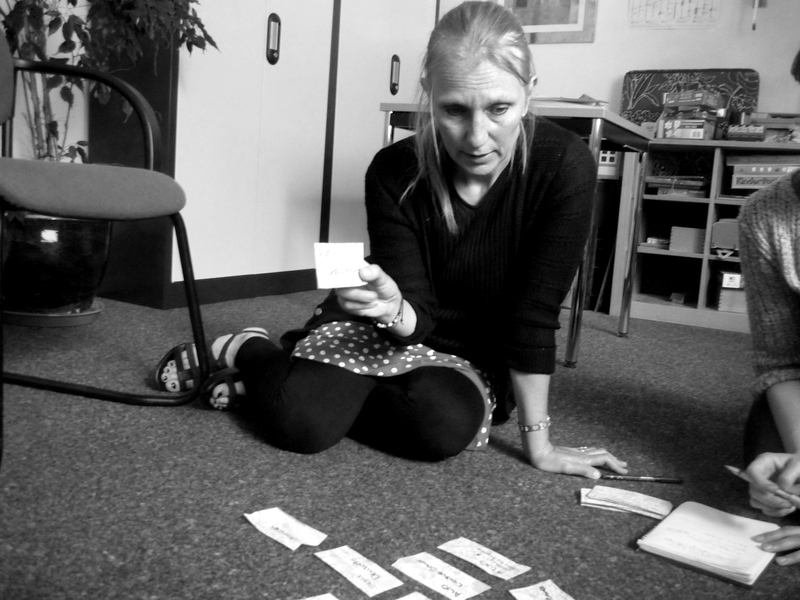 we are trained to work with different ‘tool-boxes’: one of the partners, understands more through theory and words, the other partner, understands space in a visual way and also understands relationships in a structured way. It is believed that this new ‘hybrid methodology’ would have not been achieved without collaboration using our combined knowledge. This allowed us to cover a lot of ground during our research, as well the substantial findings in terms of informality/formality within community based organisation working processes, which will be explained in the next blog entry.